My love affair with the spoked wheel began in 1980, when my dad bought me a Motobecane Grand Touring Bicycle—a pretty big deal for a Jordache jeans-wearing 13-year-old girl in Flint, Michigan! (Yeah…I know. You do the math.) Over the years, I’ve ridden all types of bicycles—cyclocross, mountain, cruisers, and of course, road. While my focus has been on endurance road riding (I finished a whopping ten centuries in the summer of 2009 alone, including the Triple Bypass), I find myself enjoying mountain riding more and more. I live for the climb—I love going deep, using mantras, and meditating on my bike. I’m not very technical OR very fast, so I’m usually the sweep—I may have to fight Deb for that job! Races and organized rides are a great way for me to fuel my thirst for achievement and suffering. You can see my full profile here. I love all bicycles. I like who I am—and other people like who I am—a lot more when I ride out the “crazy”. Yes! Like I was flying. Like I was 8 years old. That’s why I ride. I feel—and get to dress—like I’m 8 years old! I still get nervous. All the time. I use mantras a lot. I take clinics and go to camps. I learn from others. And once in a great while, I give myself a break and embrace the nervousness. I was clipless for 20 years and went back to flat platform pedals last year. Call me if you want to talk about that at all—happy to. I fell and broke my hand in 2010 and I was just getting back into mountain biking after a hiatus of road and cyclocross. No kidding, it took me a long time to come back, BUT…every time I fall and get up and I’m okay, I become a little bolder. It’s actually good for me to eat it now and then and realize that I can eat it and still be okay. I grew up riding on the dirt roads behind my house…on a three-speed and a ten-speed, so bike handling has always been my strength. For newbies, I recommend going to the park and doing all the stuff we did as kids: hanging off the bike, riding in all sorts of funny positions, trying to pop wheelies…like that. I still find wheelies elusive, but I try. I’m also a brake-rider. I love to climb but loathe the DH, so…I have to work on speed. It’s far more mental than physical. Again, I use mantras. Everything! It makes me feel strong and happy and young! Over the years, I’ve had many. Right now, I have an all-chrome cruiser bike, a Trek Madone 6.5 WSD road bike, and the love of my life: A 2015 Salsa Beargrease Carbon 1 with a Bluto. I chose that bike because I wanted to go fat year round and it’s light. I can change the Bluto out with the rigid fork for the snow (a lot of components just don’t work well in sub-zero temps) and it’s super flexible! I can run 29+ on it, snow tires, and for dirt, I’m running Large Marge Lites. It’s badass. I love the fat bike in general because of it’s stability. It’s like a dump truck. If I can pedal it, it will go over ANYTHING. 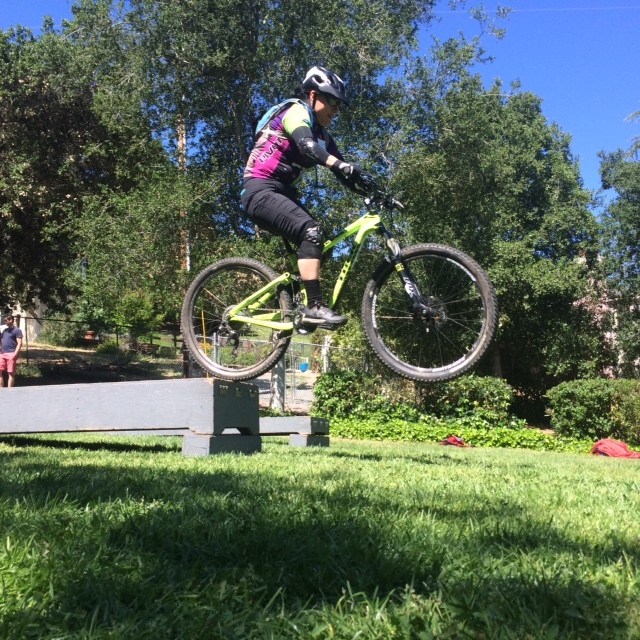 G Form pads, Five10 shoes, Spanks Pedals, Shredly Shorts, and of course, the Dirt Diva kit—it always rocks! I love Osmo nutrition products as well—they are fantastic! Also Ergon grips—I cannot live without them! 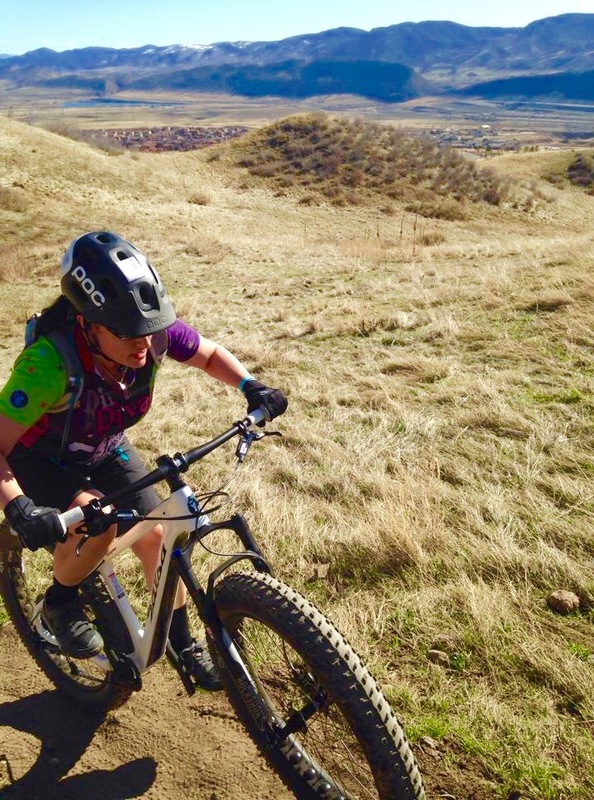 I wanted to meet other women to ride with and finding the right group in Colorado is DIFFICULT. There are so many elite riders and what I call “Starbucks” or “Café” riders—and everything in between. Dirt Divas has that, too, so it’s easy to find the right “group within a group”. OMG They are so lovely and encouraging. 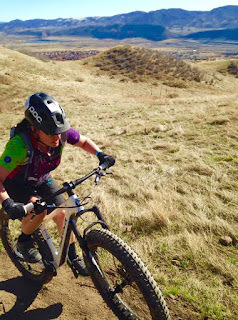 Please—what other race team in Colorado would want a 48 year old fat biker?!? The club and the race team are all about getting out, having fun, challenging ourselves, learning, progressing, and enjoying our beautiful state. What is the best thing about being able to join other women with a common interest? Not having to rely on dudes to ride with. Being encouraged. Being understood. Not having women to ride with. Thinking they are too slow/too fat/too old/too…whatever. FEAR. Sandra here. I forgot to mention Amoeba lamps. I use the helmet-mounted one for night races and it's the absolute best. Not my most-used piece of equipment, but REALLY important when I need it! For more info on amoebas, contact Jay Buthman at jbuthman@gmail.com.